We're comparing nicotine in various forms. Find out why the nicotine in cigarettes doesn't always translate to the optimal level you should be looking for in your e-liquid! Chances are, when you made the switch to vaping, you came from smoking cigarettes. If you've been vaping as long as we have, you might have been thoroughly educated by a vape shop employee about a wide range of things. What kind of device should you use? What kind of tank is best? What kind of e-liquid you should start with? And lastly, which nicotine level should be paired with your e-liquid to effectively serve as an alternative to the combustible analogs? More likely than not, the vape shop employee stated that the amount of cigarettes consumed in a given day more or less dictated which nicotine level you'd start at. For example, if you smoked a pack a day you'd want to reach for 24mg. The idea is to mimic the hit one would get from cigarettes, and get the same nicotine experience vaping that one would do smoking. The thought process presented above is flawed however. 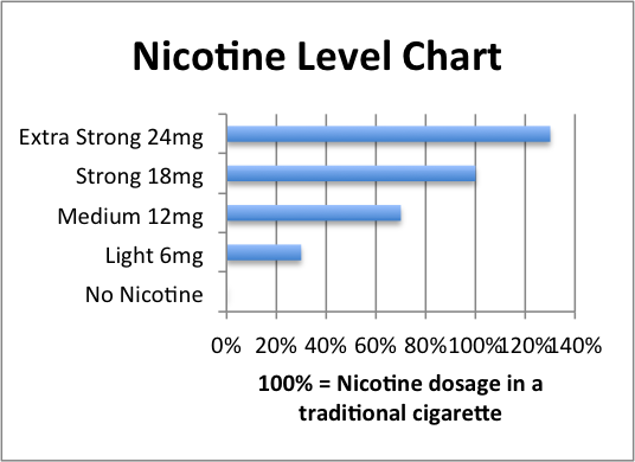 Knowing how many milligrams of nicotine in a cigarette won't necessarily translate to a particular nicotine strength with vaping; reason being that the method of delivery is far different, and even an equivalent amount of nicotine won't provide the same kick when delivered in a vape versus that of a cigarette. One would think this would be a simple question, right? The answer is no, no it is not a simple question. While your typical cigarette contains 8.4mg of nicotine, how much is actually absorbed? Back in 2014, Professor Bernd Mayer of the Department of Pharmacology at Karl-Franzens University Graz published a report detailing actual amount of nicotine absorbed by the human body. Mayer claims "smoking a cigarette results in uptake of approximately 2mg of nicotine and gives rise to mean arterial plasma concentrations of about 0.03mg/L." Despite Mayer's expertise on the subject there are other claims from other highly respected institutions. One such counter argument stems from UCLA psychiatry professor Arthur Brody, who states that there lies anywhere from 0.6 to 1.0mg of nicotine in "light" cigarettes and 1.2-1.4 in regular ones. While quantity of nicotine absorbed might be a stark difference of opinion depending on the study, it is ultimately minutia. Other factors are to be considered when it comes to the delivery of nicotine in a cigarette. When one consumes nicotine, we ourselves decide how much nicotine we take in. In the case of smoking cigarettes, we do this by smoking more or less, faster or slower, more or less often. This method of self-regulating is called self-titration, and all nicotine consumers self-consciously do it. These effects to a degree are experienced as a result of this self-titration. It's the body's way of preventing one from consuming too much nicotine, regardless of the delivery system, albeit from the drug, vaping e-liquid or smoking the cigarette. This is pretty common knowledge at this point, but we'll reiterate it. There is a stark difference between smoking nicotine and vaping nicotine. This is largely due to the chemical process or burning versus vaporizing. 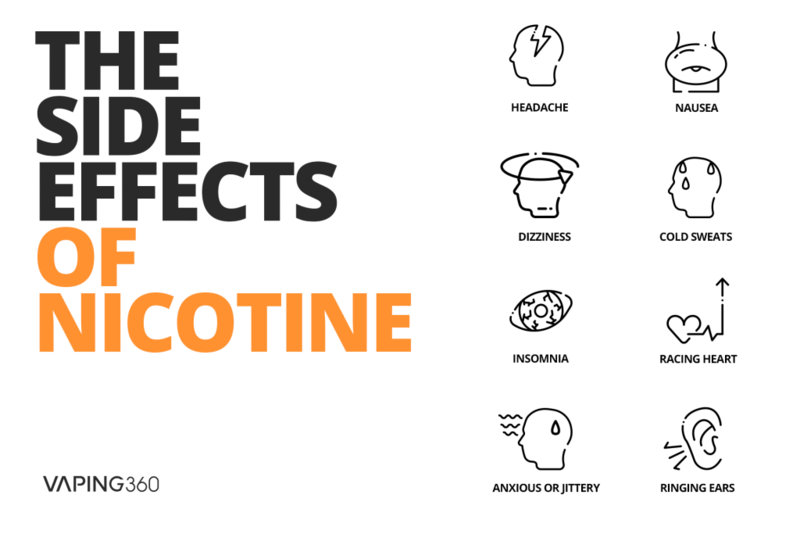 When it comes to smoking nicotine, the mild stimulant at higher levels creates what is called Monoamine Oxidase Inhibitors (MAOI). MAOIs reinforce the pleasure of the nicotine in your brand, and Ammonia supercharges the nicotine so the brain wants it over and over again. Couple this chemical property with everything else in the cigarette - smoke, tar, carbon monoxide - and you have this dangerously addictive and very unhealthy compound entering into your system every time you inhale. Vaping nicotine is a different story however. While most e-liquid blends contain nicotine, the base ingredients that constitutes the blend allow a different chemical process to occur. The propylene glycol (PG) and vegetable glycerin (VG) mixed with flavorings bind onto a coil that is heated, not burned. The blend itself does not contain tar or other chemicals upon consumption. The result from this chemical process is that vaping nicotine is LESS ADDICTIVE compared to that of traditional cigarettes. No other nicotine delivery mechanism provides the addictive blast than that of a cigarette. Will there ever come a time where cigarettes and e-cigarettes cooperate? Imagine this - cigarette brands developed a way to offer nicotine-free, or at least less-addictive options, the same way BLVK Unicorn and other e-liquid manufacturers do. What would that look like? In July of last year FDA Commissioner Scott Gottlieb announced that the agency was beginning to research a plan to have tobacco manufacturers do just that. The theory is that eliminating cigarettes' addictive potential while allowing high-nicotine alternatives such as e-cigarettes to remain on the market, many smokers would migrate to either tier of products depending on their needs. While this particular theory isn't necessary an original idea, it's a step in the right direction. Developing low-nicotine cigarettes has been around since 1994 and the reason why it hasn't fully taken off is that the plan faces several hurdles in which a solution might or might not yet be attainable. The first hurdle Gottlieb's plan faces first and foremost is time - and that means the plan will have to be carried out by future administrations and FDA regulators. If the transition between the Obama administration to that of Trump was to give any sort of insight about the ramifications of political polarity, the swift stroke of a pen can ultimately eliminate a project from the table. The next hurdle in completing this plan is the enforceabilty carried out by the FDA. As a regulatory agency, the institution can enact rules - but what is to keep the tobacco industry from spawning a "more-troublesome" black market filled with unregulated high-nicotine products? On the R&D side of the plan, the FDA would have to prove substantial evidence that such a proposal would work nationwide. The cost of developing a comprehensive report that captures nearly every smoking demographic might just as well render the entire project ineffective. Lastly, should the project look promising, the last hurdle would be to convince Congress to write the project into bill. The long and arduous process of proposing the bill and inevitably passing it into law would prove time consuming and expensive. Should the project fail, Congress would be better off in amending theFamily Smoking Prevention and Tobacco Control Act to eliminate the FDA's authority to alter nicotine content at all. Should Gottlieb's plan works and all future administrations stand behind it, the FDA will solely be responsible for eliminating nearly 90 percent or more of the nicotine from cigarettes. This would be one of the most significant political and public health victories the United States has ever seen.